Transformations can be so difficult for students to visualize. It’s really important for middle and high school students to engage in hands-on activities that facilitate a concrete understanding of the topics, without simply memorizing some rules. Here are four strategies to consider when planning your transformations unit. Allow students to discover the big ideas. A few months ago I was working as a math interventionist with a small group of eighth graders who were learning transformations. I asked a few questions at the start of the lesson to gauge what they already knew. They could recall some of the “rules” and “formulas” for what happens to coordinates given different transformations, but they didn’t really remember which rules pair with which transformations. The discovery lesson that I brought was a perfect match for their needs. We practiced rotating polygons around the origin 90, 180, and 270 degrees. However, we accomplished this not by stating some rules and trying to follow, but instead by turning our paper, visualizing, and using logic to work our way through the problems. The goal of this lesson was to make meaning out of the rules that we summarized at the end. My discovery lessons for Rotations, Reflections, Translations, and Dilations can be found in my store. Engage students in hands-on learning. Once students have played with the ideas and taken notes on the concepts, allow plenty of time to practice using different activities and strategies. Task cards are great because they allow students to focus on one transformation at a time. Card sorts allow students to work collaboratively to divide transformations into categories. Cut and paste activities are also really engaging for students! Also, click here to read about how Brigid from Math Giraffe uses plastic plates to engage her students in hands-on learning… such a neat idea! And, of course, my favorite… play a game! My students and I love to play Old Math Guy to practice matching graphs with the type of transformation shown. Visit this post to learn more about how to play Old Math Guy in your classroom. Thanks for reading! You can also scoop up a discounted bundle of all of the resources mentioned in this post here. Now it’s your turn to join the conversation! 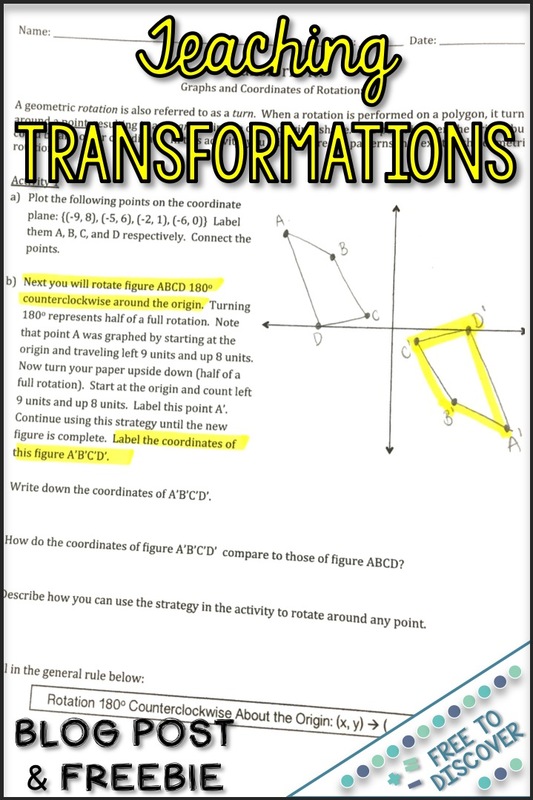 What are your favorite activities when teaching transformations? Any tips or tricks to share? For more ideas and resources, subscribe to the Free to Discover blog! You’ll receive a free resource via email just for signing up!